Download "Job Description. Directorate Community JD Last updated 11 June 2013 Location Colchester Hours 37.5 pw"
2 meetings. Deal with confidential information regarding the administration team seeking advice from managers or HR as required. Train and support volunteers in the service. Key responsibilities Scheduling 1. To plan, produce & maintain the Nursing rota for a 24/7 nursing team consisting of Registered and Assistant Nurses a minimum of 4 weeks in advance recognising the need to ensure patient safety and adequate staff rest periods. 2. Analyse the nursing staff ratios to ensure patient safety is maintained at all times. 3. 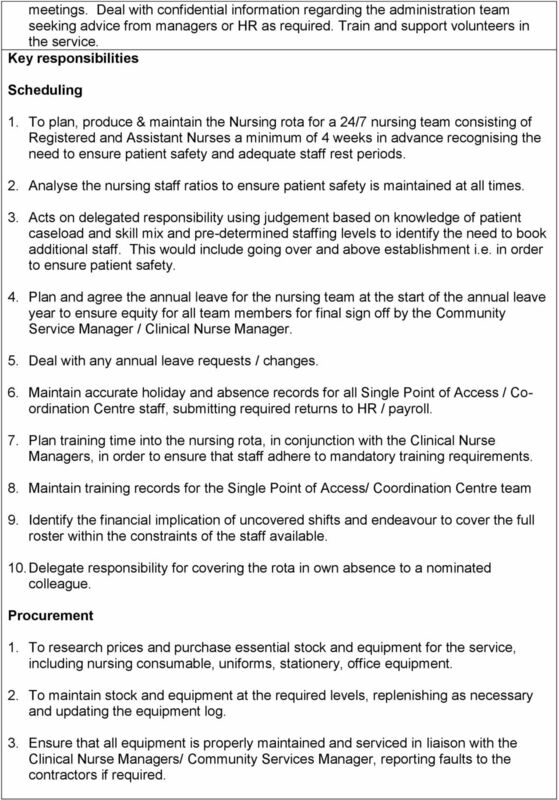 Acts on delegated responsibility using judgement based on knowledge of patient caseload and skill mix and pre-determined staffing levels to identify the need to book additional staff. This would include going over and above establishment i.e. in order to ensure patient safety. 4. Plan and agree the annual leave for the nursing team at the start of the annual leave year to ensure equity for all team members for final sign off by the Community Service Manager / Clinical Nurse Manager. 5. Deal with any annual leave requests / changes. 6. Maintain accurate holiday and absence records for all Single Point of Access / Coordination Centre staff, submitting required returns to HR / payroll. 7. Plan training time into the nursing rota, in conjunction with the Clinical Nurse Managers, in order to ensure that staff adhere to mandatory training requirements. 8. Maintain training records for the Single Point of Access/ Coordination Centre team 9. Identify the financial implication of uncovered shifts and endeavour to cover the full roster within the constraints of the staff available. 10. Delegate responsibility for covering the rota in own absence to a nominated colleague. Procurement 1. To research prices and purchase essential stock and equipment for the service, including nursing consumable, uniforms, stationery, office equipment. 2. To maintain stock and equipment at the required levels, replenishing as necessary and updating the equipment log. 3. Ensure that all equipment is properly maintained and serviced in liaison with the Clinical Nurse Managers/ Community Services Manager, reporting faults to the contractors if required. 3 4. Maintain budgetary control of office equipment, stationery, uniforms. Refer to the Community Services Manager for orders/invoices over 500. Administration 1. Make and receive calls and provide appropriate information to caller, passing onto clinical staff as required. 2. To provide full secretarial and clerical support to the clinical members of the team instigating remedial actions to resolve problems where appropriate. This will include audio-typing, production of reports, minute taking & presentations, preparation of documents & rotas, dealing with incoming post, prioritising and distributing it as per procedure. 3. Provide a central point of communication for queries to the centre and liaise with the clinical team / service manager as appropriate. This includes taking incoming calls from patients, families and professionals and liaising with external agencies. 4. To communicate with patients, families, friends and professionals on the telephone, face-to-face and electronically. 5. 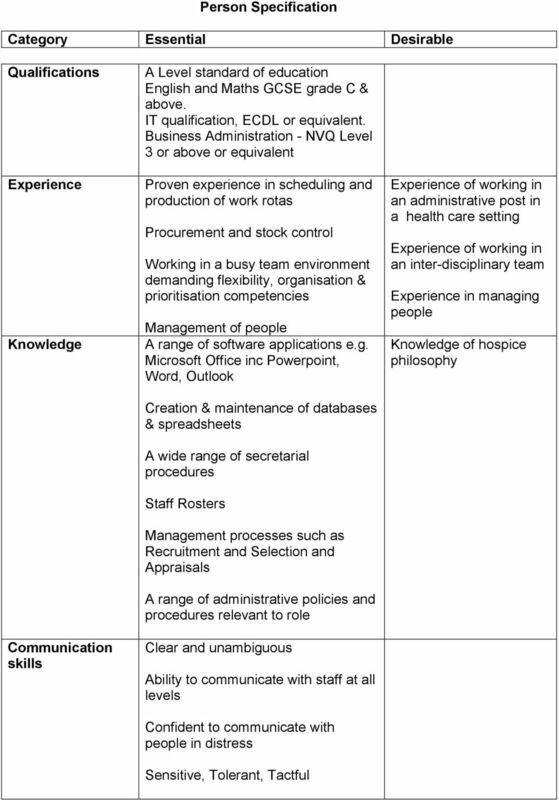 To be responsible for the overall maintenance of the end of life care register, as directed by the Community Services Manager. 6. Support and direct volunteer Administrators as necessary in their day to day duties. 7. Induct and demonstrate procedures to new Administrators and volunteers. 8. 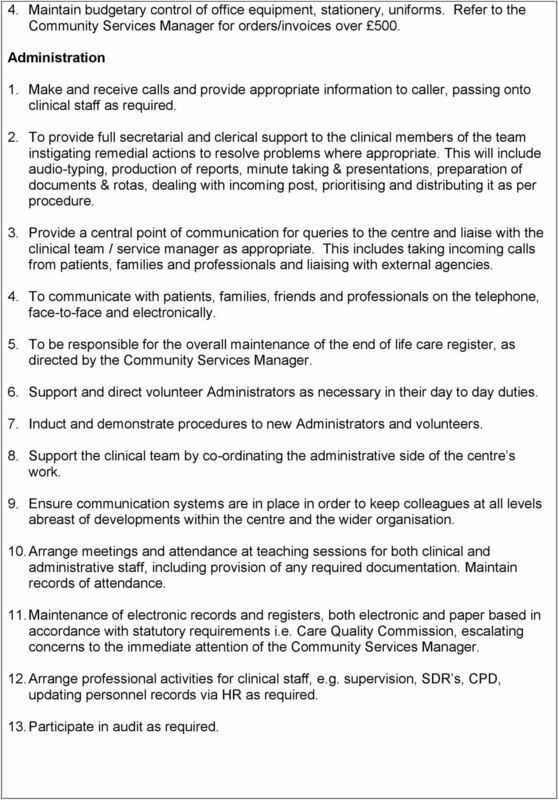 Support the clinical team by co-ordinating the administrative side of the centre s work. 9. Ensure communication systems are in place in order to keep colleagues at all levels abreast of developments within the centre and the wider organisation. 10. Arrange meetings and attendance at teaching sessions for both clinical and administrative staff, including provision of any required documentation. Maintain records of attendance. 11. Maintenance of electronic records and registers, both electronic and paper based in accordance with statutory requirements i.e. Care Quality Commission, escalating concerns to the immediate attention of the Community Services Manager. 12. 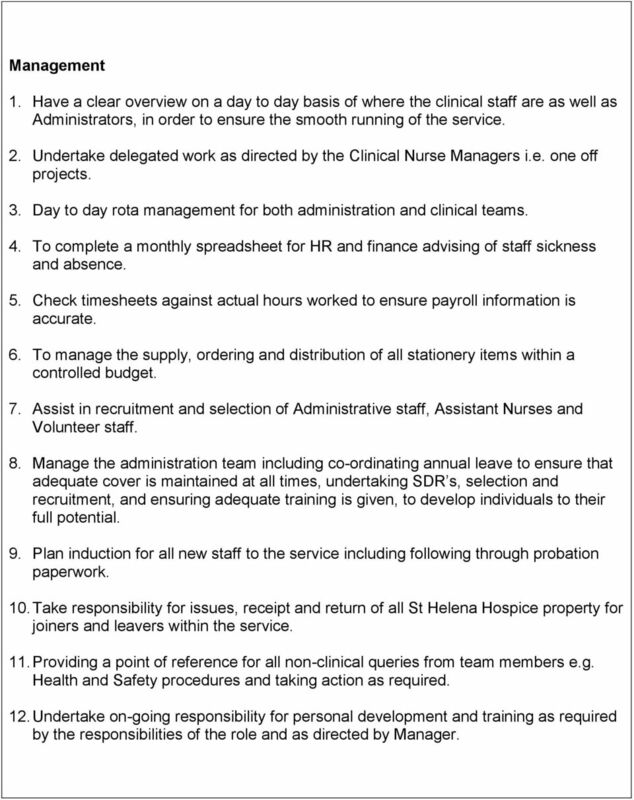 Arrange professional activities for clinical staff, e.g. supervision, SDR s, CPD, updating personnel records via HR as required. 13. Participate in audit as required. 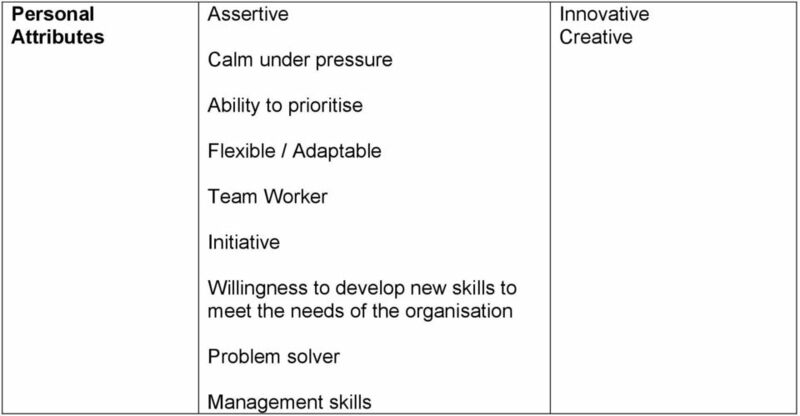 4 Management 1. Have a clear overview on a day to day basis of where the clinical staff are as well as Administrators, in order to ensure the smooth running of the service. 2. 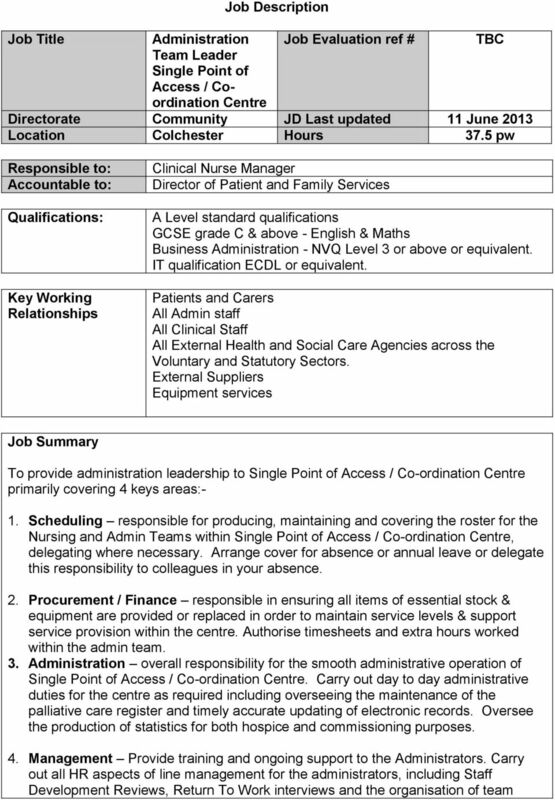 Undertake delegated work as directed by the Clinical Nurse Managers i.e. one off projects. 3. Day to day rota management for both administration and clinical teams. 4. To complete a monthly spreadsheet for HR and finance advising of staff sickness and absence. 5. Check timesheets against actual hours worked to ensure payroll information is accurate. 6. To manage the supply, ordering and distribution of all stationery items within a controlled budget. 7. Assist in recruitment and selection of Administrative staff, Assistant Nurses and Volunteer staff. 8. Manage the administration team including co-ordinating annual leave to ensure that adequate cover is maintained at all times, undertaking SDR s, selection and recruitment, and ensuring adequate training is given, to develop individuals to their full potential. 9. Plan induction for all new staff to the service including following through probation paperwork. 10. 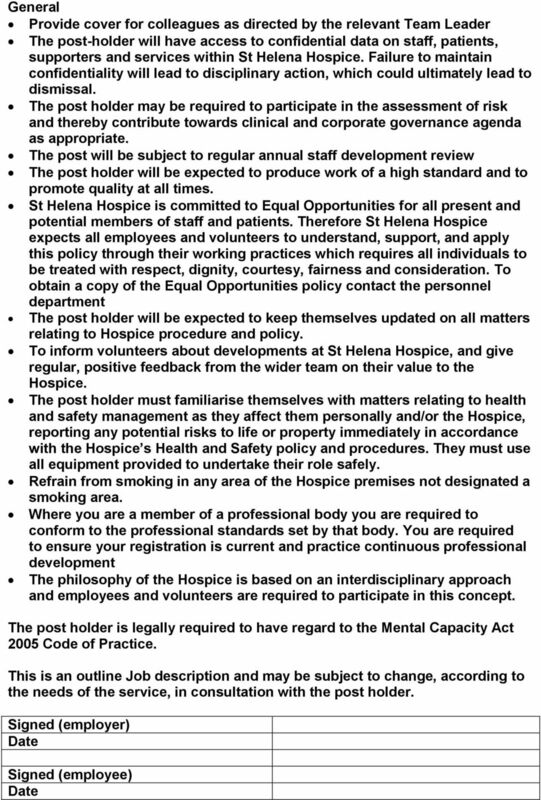 Take responsibility for issues, receipt and return of all St Helena Hospice property for joiners and leavers within the service. 11. Providing a point of reference for all non-clinical queries from team members e.g. Health and Safety procedures and taking action as required. 12. Undertake on-going responsibility for personal development and training as required by the responsibilities of the role and as directed by Manager. JOB DESCRIPTION. Project Support Team Project Doctors Project Nurses Project OD Project Trainer Other Project Support.